April 6: Open—the site is open from noon to 4 pm. April 13 (corrected date): Weiser Interpretive Program—enjoy an afternoon of history. Noon-4 pm. April 8: Friends Lecture Series—“The Waterworks at Schaefferstown,” with speaker Larry Stohler. Lectures are held in Freeman Hall auditorium at Cornwall Manor. 7 pm. April 5: Boone’s Beerfest—food, beer, music, house tours, and a brewing demo (historical techniques). Cost is $40, $10 for designated drivers. 2-6 pm. April 13: Pennsylvania German Easter and Spring Nature Program—lots of family activities, an Easter egg hunt, and a chance to learn about Pennsylvania German Easter traditions. Admission is $4 per person (age 3+). Noon-4 pm. April 12: Family Day—Held throughout the year, Family Day programs include crafts, movies, music and more. Included in museum admission; special family rate – up to 2 adults and 3 children for $20. April 24: Heritage Lecture Series—special admission fee – adults (age 12-64), $5; seniors (65+), $4; children and Friends of Drake Well members, free. April 26: Oil Valley Blacksmiths—this organization meets at Drake Well on the last Saturday of every month through October, providing demonstrations for visitors. Included in museum admission. 9 am-2 pm. April 12: Tour Guide Training and Volunteer Meeting—if you’re interested in volunteering with Eckley’s programs or learning to guide tours of the village, this is a good time to start. Volunteer meeting is at 10 am, tour guide training at 11. Eckley is also looking for a volunteer to serve as Volunteer Coordinator. Call 570/636-2070 to sign up or to learn more. April 3: Winter History Class Field Trip—travel to the Moravian Historical Society in Nazareth and the Troxell-Steckel House in Egypt (PA). $70 includes transportation, admissions, and lunch. Call 717-733-6600 to see if space is still available. April 9: Storytime—Designed for preschoolers and their adults, the program pairs a story with a related craft or activity. Cost is $6 for an adult and accompanying child (age 3-5), $3 for each additional child; FREE with family-level membership in Ephrata Cloister Associates. 10-11 am. April 12: Spring Search—children can hunt for clues all over the site, getting stamps in their Heritage Passports and earning a prize and treat if they find all the clues. Admission for children ages 11 and younger, $1; adults (12-64), $10; seniors (65+), $9 (free admission for members of Ephrata Cloister Associates and Pennsylvania Heritage Foundation). 1-4 pm. April 25: Community Days School Program—Designed for school aged students, this program encourages exploration through a range of learning stages across the site. Reservations strongly encouraged. Visit the website for details. 9:30 am-1 pm. April 12: Little Mates Easter Egg Hunt—members of the museum’s Little Mates Kids Club are invited to tour the museum and ship, make Easter crafts, and visit with the Easter bunny. Not yet a member? You can join when you register for the program. RSVP deadline is April 4. April 5: Victorian Tea and Tour—start with a visit to the chair exhibit, then enjoy a guided walk through the village and a three-course tea at the Landis Valley House Hotel. Reservations are required by April 1. 10 am. April 12: Paper Folding—part of the Museum Store’s “Folk Art and Friendship” series. Registration is required; call 717/569-9312. 1 pm. April 12: Spring Benefit Auction—there’s a silent auction and a live auction, plus food and beverages for sale, to benefit the museum. Doors open 4:30 pm, live auction starts at 5:30 pm. April 5: The Art of Blacksmithing—visit the blacksmith shop and watch a demo of this important skill. Included in regular admission, so please start at the Visitor Center. 11 am-4 pm (site open 10 am-5 pm). April 12: 19th-Century Foodways: Breadbaking and Cooking—learn how the Harmonists (and many of their contemporaries) prepared meals – you might even get to sample homebaked bread. Included in regular admission, so please go to the Visitor Center first. 11 am-4 pm (site open 10 am-5 pm). April 12: Easter Egg Hunt—bring the kids for an old-fashioned good time. Rumor has it the Easter Bunny will bring along some friends for the children to visit as well. Designed for children 10 and younger. $5 per person (adults, too) includes refreshments. Paid reservations by April 9; call Holly Dofner, 724/266-4500 x102. 9-11 am (hunt starts promptly at 9:15). April 26: Meet the Gardeners—OEV is known for many things, including its beautiful gardens. Today you can talk with some of the volunteers who tend those gardens and ask questions about your own gardening needs (many of them are Master Gardeners). Included in regular admission, please purchase your tickets at the Visitor Center first. 11 am-4 pm (site open 10 am-5 pm). April 6: Historic Trades and Open Hearth Cooking—the blacksmith, the joyner, and the cooks will all be on hand to demonstrate their skills with (respectively) metal, wood, and fresh spring ingredients. Included in regular admission. 1-4 pm. April 13: Living History Theater—“The Funeral of Phineas Pemberton” sheds light on a man William Penn called “one of the best men of the Province” and explores funeral customs in 17th-century Pennsylvania. Included in regular admission. 1-4 pm. April 27: Garden Highlights and Beer Brewing Demonstration—explore the kitchen garden, talk to the gardeners, and learn how the brewers turn barley and hops into beer (sorry, no samples). Included in regular admission. 1-4 pm. April 12: Spring Antiques and Collectibles Show—held at Pine Creek Inn (1637 Route 6 West) due to visitor center expansion project. 10 am-4:30 pm. April 2: Friends Richard Koontz Memorial Lecture Series—Dr. Greg Ferro, Penn State Univ., will present “Richard M. Nixon – The Nation’s Vietnam War and the President’s Personal War.” Donations accepted. 7:30 pm. April 26: Kids Day: Dress Up and Discover! !—kids of all ages can try on field gear and head gear from the museum education collection. Photo backdrops will be set up in the museum theater and there will be learning stations throughout the galleries. Included in regular admission. 10 am-3 pm. April 26: Exhibit opens—“A First Class Restaurant on Wheels: The Story of the Railroad Dining Car” includes artifacts and photos of the golden age of dining cars. Included in museum admission during regular hours, through December 31. April 7: “PA German Music, Dance, and Instruments”—Keith Brintzenhoff, through the PA Humanities Council Commonwealth Speakers Program, offers an overview of Pennsylvania German music traditions through lecture and performance. The presentation will be followed by the Historical & Genealogical Society of Somerset County’s Annual Meeting. Admission is free. 6 pm. April 12: Pysanky Egg Workshop—Jennifer Mudery, who demonstrates traditional egg decorating at Mountain Craft Days, will teach a beginner class. $30 includes all materials needed to get started ($25 for HGSSC members). Call 814/445-6077 to register. State Museum of Pennsylvania April 4: State Geography Bee—100 participants from around the state will compete for the state title. Final round starts at 3:30 pm, followed by a brief award ceremony. April 18: 3rd in the Burg/Learn at Lunchtime—visit with staff of the Susquehanna Art Museum to learn about their exhibit, “Lost World/Found World.” Museum admission is free during the event. 11 am-1:30 pm. April 27: Exhibits closing—Last day to see “Chairs from the Collection of the State Museum” and “South Central Pennsylvania Scholastic Arts Exhibit.” Included in regular admission. April 6: Chocolate – A Look into an 18th-Century Chocolate Drink—in the 18th century chocolate was generally for drinking (not hoarding in your cubicle to sneak bites of when the 3 pm blues roll around - but I digress). Join Connie Unangst to learn more and sample some drinking chocolate. Admission is $6. 11 am. Fingers crossed, the warming trend looks sort of promising for the official start of spring. Time to think about planting gardens and making plans that don’t include a snow date. We’ve shared details of the restoration project at Old Economy Village that is focused on the George and Frederick Rapp Houses throughout the winter, thanks to their blogging curator, Sarah Buffington. The photo above shows the arrival of reproduction carpet, based on historical examples. It’s vicarious fun to see these project milestones accomplished. At least it is for me. Flagship Niagara League is helping the Regional Science Consortium win a “Grassroots Grant” from the BoatUS Foundation to support a new offshore weather buoy for Erie that would assist all boaters (including Niagara’s crew). You can vote once a day on the BoatUS Foundation Facebook page until March 28 (be aware that you have to “like” their page in order to vote). Speaking of ships, Chuck Smith at the Pennsylvania Military Museum shared an interesting story with me. He was looking for graphics to add to some signage on the museum grounds to help explain the history of the Pennsy Guns (you can read more about them on the PMM website). 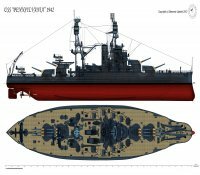 His search led him to a Polish graphic artist, John S. Lipiecki, who has done a considerable amount of research and writing on the USS Pennsylvania and similar ships, although his articles are not yet translated into English. Mr. Lipiecki has generously agreed to let the museum use his drawing at no charge. 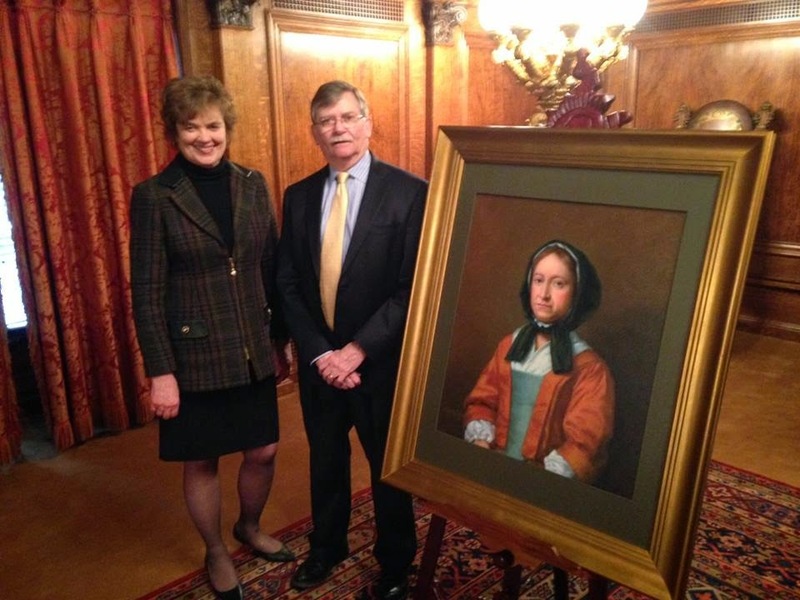 A newly commissioned portrait of Hannah Callowhill Penn, second wife of William Penn and acting proprietor (essentially governor) of Pennsylvania from 1712 until her death in 1726, was unveiled on March 19 at the Pennsylvania State Capitol. Hannah Penn is the first woman to have her portrait hang in the Governor’s Office, where she will join other former governors of the Commonwealth. You can learn more about Hannah Penn, especially her life here in Pennsylvania, by visiting Pennsbury Manor. March 23: Women’s History Lecture—Program is at 2 pm. March 29: Edwin Drake’s Birthday—come celebrate Col. Drake’s 195th birthday by visiting the birthplace of the modern oil industry. Also, March kicks off the monthly meeting and demonstrations of the Oil Valley Blacksmiths (last Saturday of every month through October). 9 am-2 pm. Both are included in regular museum admission. 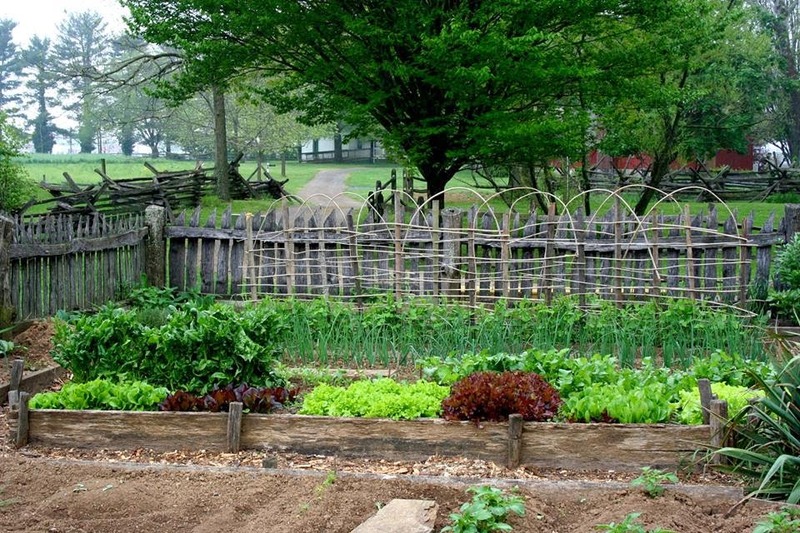 March 22: Spring Planting—the next installment in the “Making History Workshops” series. 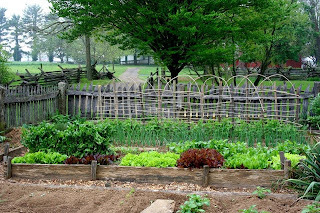 Learn about historic seed and plant varieties and start planning your garden. Cost is $15 ($10 for members of Ephrata Cloister Associates). 10 am-noon. March 27: Winter History Class—class began in February, but you can still sign up for the remaining sessions or the field trip on April 3. March 28-29: Stuffed Animal Sleepover—preschoolers can leave a stuffed animal or doll to have an adventure at the site, then return the next morning (with an adult) to take part in the same activities. Cost is $6 for an adult and one child (age 3-5), $3 for each additional child; FREE for family-level members. Drop off is between 3 and 5 pm on 3/28; morning program on 3/29 runs 10 am-noon. March 22, 29: Folk Art & Friendship Classes—tole painting and scratched eggs are the topics for this month’s remaining classes (registration required, details on the website). 1-3 pm. March 29: Community College of Beaver County—is offering a series of non-credit courses taught on-site at OEV. Homemade Bread Baking will use one of the site’s brick bake ovens. More info is on the website. March 22: Documentary Film—“You Enter Germany: Bloody Huertgen and the Siegfried Line,” a German documentary released in 2007 includes archival footage and interviews with veterans. Donations accepted. 1:30 pm. March 21: 3rd in the Burg—This month features the South Central Pennsylvania Scholastic Arts Awards (5:30-7:30 pm) and a Doshi Dialogue in the Susquehanna Art Museum’s Doshi Gallery (6:30 pm). The Scholastic Arts Awards will also be the focus of a Learn @ Lunchtime program on March 28 at noon. It looks like we had around 10,000 people on the Trails of History for Charter Day this year. Were you one of them? If so, please leave a comment telling us where you visited. If you weren’t, there are still plenty of things to do this month. 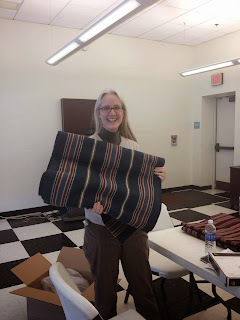 Folks at Ephrata Cloister have been busy with new workshops and the annual Winter History Class. I was able to attend the history class for a second time this year (I reported on my previous visit in an earlier post) and heard an excellent presentation by one of last summer’s interns. Brendan Kerr, currently a student at Temple University, talked about his research project on The Martyrs Mirror, an important Mennonite text that was first translated from Dutch to German at Ephrata (and printed there as well). Mike Wagner, Ephrata’s maintenance foreman, contributed to the “Chronicle Ephrata” blog with a post that will resonate with anyone who has ever seen their to-do list go down the tubes. Landis Valley Village and Farm Museum just opened its 2014 exhibit, “Chairs, Chairs, Chairs,” which looks at high-style and vernacular chairs produced in Lancaster and Berks Counties from 1750 to 1875. With chairs and other objects drawn from Landis Valley’s collections or on loan from other institutions and private collections, the exhibit (on view through December) looks at a variety of techniques, styles, and patterns (I hope to write a more detailed post in the coming weeks). Don’t forget that the exhibit of chairs from the State Museum of PA collection continues through April 27. 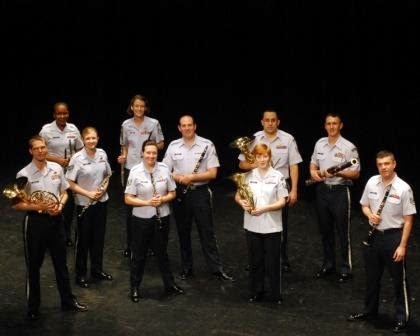 Speaking of the State Museum, at noon today, March 14, the Learn @ Lunchtime series presents the US Air Force Band chamber group, Langley Winds, performing in Memorial Hall. Museum admission is free from 11 am to 1:30 pm. If you're looking for some intriguing weekend reading, Graeme Park recently posted some very interesting information on their blog, The Graeme Park Commonplace Book, about research into “lifting stones,” which reflect the Celtic heritage of Sir William Keith, the Pennsylvania governor who first settled the site. Thanks to all of you who ventured out into the lovely spring-like weather this weekend to visit the Trails of History. 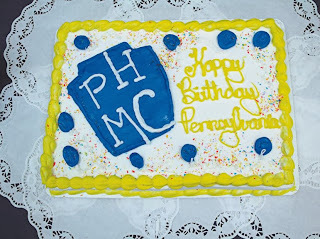 We had lots of folks stop by on Charter Day to help us celebrate Pennsylvania’s 333rd birthday. Sites shared photos and info about their programs on Facebook and Twitter (and other places too), and local news outlets picked up the story both before and after the event. As noted in Friday’s post, Pennsbury Manor chose Charter Day to kick off the celebration of their 75th anniversary as a historic site. Gov. 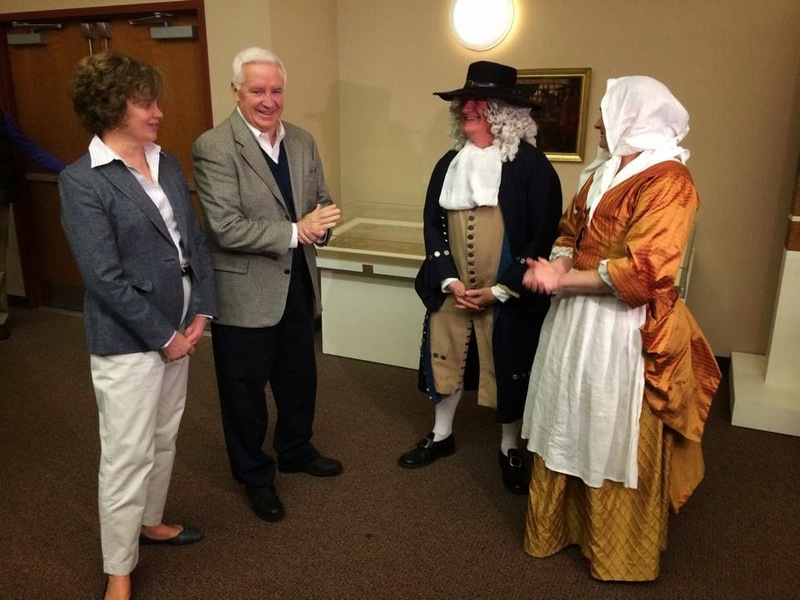 Tom Corbett and First Lady Susan Corbett were on hand and met with William and Hannah Penn. The original charter of Pennsylvania, given to William Penn in 1681 by King Charles II, will be on exhibit at Pennsbury through March 16 before returning to the Pennsylvania State Archives. 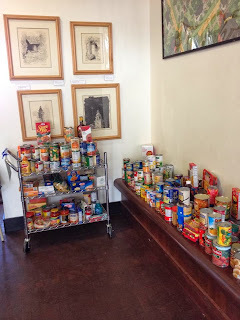 I saw on Twitter that Pennsbury visitors (and I’m guessing some staff and volunteers) donated more than 250 pounds of non-perishable food for the Penndel Food Pantry. First Lady Susan Corbett’s Facebook page shared a photo with the original charter and archivist Linda Ries. You’ll find a bunch more Charter Day photos on Facebook: Daniel Boone Homestead, Cornwall Iron Furnace, Eckley Miners’ Village, and Ephrata Cloister. I’ve probably missed some and will try to update as we go. Coverage from print and broadcast media was good as well: Somerset Historical Center, Joseph Priestley House, Lancaster County sites (Ephrata, Landis Valley, and Railroad), Pennsylvania Military Museum, and the Erie Maritime Museum. Sunday, March 9, is Charter Day, our annual celebration of King Charles II of England granting William Penn the land that became our Commonwealth. This year, Charter Day is also the kick-off for Pennsbury Manor's 75th anniversary as a historic site telling the story of William Penn, his family, and his ideals of government and justice. The original 1681 charter will be on display at Pennsbury for one week only (through March 16) for this auspicious occasion. Other special activities are planned, including craft and cooking demonstrations and living history theater presentations. 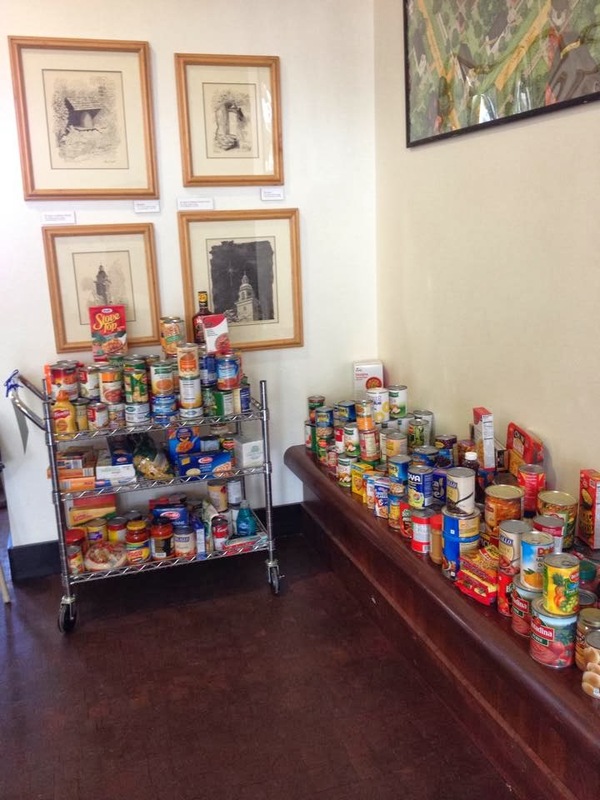 Visitors are asked to bring a non-perishable food item for Bucks County's Penndel Food Pantry. Charter Day admission is free at Pennsbury and the rest of the Trails of History sites (there are a couple of sites that are not yet open for the season, so please check ahead if you don't see your favorite site listed below). Last week's post listed all the March activities, but I've distilled the list below to focus on this weekend. Don't forget to set your clocks ahead one hour or you might miss out on the fun. March 9: “WYSO” The Coal Connection: Art of Frank Wysochansky—in addition to other Charter Day activities, speaker Steven J. Lichak will present a talk about WYSO, a prolific artist whose work tells the story of Pennsylvania coal miners, and then lead a brief tour of the exhibit (open through October). Museum opens at noon, program is at 2 pm. March 9: Charter Day re-opening—and the site’s largest living history event of the year. Noon-4 pm. March 9: Special Charter Day Tours of the Furnace—tours today will feature a visit from a historical character, in addition to the awesome furnace itself. Noon-4:30 pm. March 9: Charter Day Open House—music and dancing, open hearth cooking, storytelling, and much more. Noon-4 pm. March 9: Charter Day—presentations about Native American history will be on the program, in addition to the site’s regular offerings. Noon-5 pm. March 9: Charter Day film presentation—F. Charles Petrillo and Dr. Phil Mosley will present a program of 20th-century anthracite mining films and discuss the history of the anthracite region. Site opens at noon, program is at 2 pm. March 9: Charter Day—as part of the site festivities, the Ephrata Cloister Chorus will perform in the Saal (meeting house) at 2, 3, and 4 pm (site opens at noon). March 9: Charter Day—the ship is still under winter cover but it is visible and there’s plenty to see indoors, including the Civil War Medal of Honor exhibit. Noon-4:45 pm. March 9: Charter Day—the museum is open free of charge, 10 am-5 pm. March 9: Charter Day—be sure to take a free tour of the Keith House today. Noon-4 pm. March 9: Charter Day—the Mansion will be open today free of charge. Noon-4 pm. March 9: Charter Day and Dr. Priestley’s Birthday—visit with costumed docents in each room (including the laboratory), watch the Spinners and Weavers Guild at work in the kitchen, and wish Dr. Priestley a happy birthday while he demonstrates the wonders of chemistry in the Pond Building. 1-4 pm (chem demos at 1:30 and 2:30). March 9: Exhibit opening—Charter Day is the launch point for a new temporary exhibit, “Chairs! Chairs! Chairs! 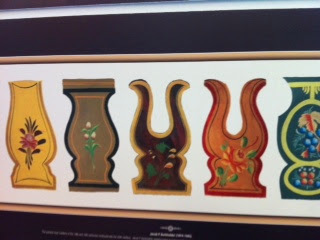 Handcrafted Traditions from Rural Pennsylvania, 1750-1875,” which will be on view through December. Other Charter Day activities include craft demonstrations, horse-drawn wagon rides (weather permitting), and tours. Noon-5 pm. March 8-9: Charter Day and Center for Hope Weekend—Admission is free, but the site will be collecting canned or boxed food items for Ambridge’s Center for Hope. Please bring hearty foods that can be the basis for a meal (such as soups, spaghetti and/or sauce, stews, etc.). Saturday, 10 am-5 pm; Sunday, noon-5 pm. March 8-9: Military Movie Madness Festival—PMM kicks off the 2014 museum season with three films exploring military themes. Included in museum admission on Saturday; admission on Sunday is free for Charter Day. Movie details and showtimes are on the PMM website. March 8: Read Across America Day—celebrate Dr. Seuss’s birthday by wearing your favorite hat and listening to stories read by an array of special guests. There will also be a Suitcase Adventure activity, with travel stickers from Pennsylvania railroads. Registration fee is required for “Breakfast with the Conductor and Catcher”; call the museum—717/687-3892—to see if there are still spaces available. The program (except breakfast) is included in regular admission. Museum open 9 am-5 pm; story times are every 45 minutes from 9:30 to 3:30 (there is no 12:30 story). March 9: Charter Day-the museum is open free of charge from noon to 5 pm. March 8-9: Sugar in the Mountains, Maple Taste and Tour—experience Somerset County’s maple history and visit the site’s 1860s sugar camp; includes tractor-drawn wagon rides. Offered in partnership with the Somerset County Maple Producers, which means that other sugar camps in the county will be open for visitors. Admission is by donation. 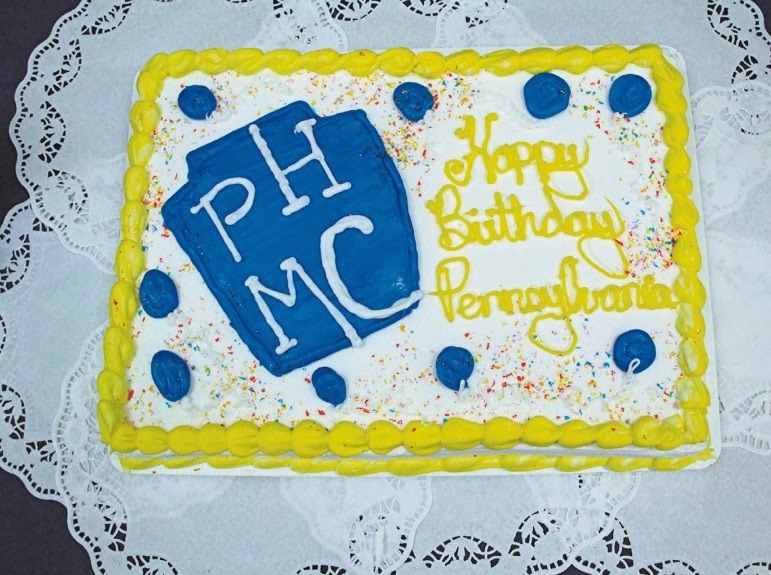 March 9: Charter Day—Storytelling, visits with "William Penn," a chance to honor student achievement at National History Day in PA, the Victorian Dance Ensemble, and representatives from historical organizations throughout the Harrisburg area. Since the official 1681 Charter will be at Pennsbury Manor, the State Museum and Archives will display a final draft of the document, with staff and volunteers on hand to provide info. Program details are on Facebook. March 9: Charter Day—site will be open free of charge and new temporary exhibits will be opening in the Visitor Center. 10 am-4 pm.